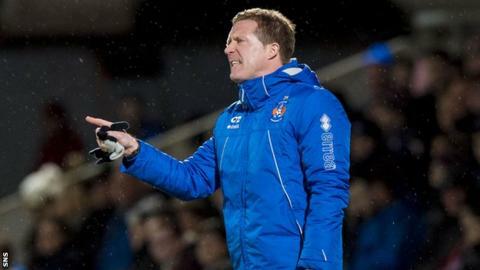 Kilmarnock manager Gary Locke admits he is concerned at their league position after a 3-2 defeat to Ross County left them in a precarious position in the Scottish Premiership. Locke's men are 11th, one point behind Motherwell, but the Steelmen now have three games in hand. Bottom side Dundee United are 10 behind, but have two games in hand to close the gap. "Of course you get concerned," Locke told BBC Scotland. "But, we've a lot of players missing at the moment so I'm well aware we've got a lot of players to come back. Once we get these lads back it'll strengthen the team." Kilmarnock led briefly after Tope Obadeyi cancelled out Craig Curran's opener before Josh Magennis put the visitors in front. However, a Michael Gardyne double ensured Kilmarnock returned to Ayrshire empty handed. "We battled well, there was a lot of positives to take from the performance," said Locke. "It's been a difficult few days with so many of the boys being ill.
"We just couldn't hold the lead for long enough. If we could have held it for another 10 minutes I could see us going on to win the game. "Over the piece there was a lot of positives, we created a lot of chances, it's just important we stop giving away sloppy goals." Ross County manager Jim McIntyre paid tribute to Gardyne, who as well as his two goals also had a hand in the opener. McIntyre said: "When we needed a spark Michael Gardyne provided that. Over the last year he's shown a real consistency to his play, he's really added another dimension by getting on the score sheet on a regular occurrence for a wide player. "He also does a lot of the unseen work which is tracking their full back and doing his shift for the team. We needed a bit of quality and he certainly provided that tonight." County are now just one point off fourth place in the Premiership, with a League Cup semi-final against Celtic coming at the end of January. "That's the first league wins back to back in since August," he said. "It was important that we did that and it sets us up perfectly for the derby now. "We're trying to become a more consistent football club and that helps you achieve you goals."